BERNIE SANDERS BROADENS HIS APPEAL IN OF ALL PLACES SOUTH CAROLINA | Concise Politics -- Your Time should NOT be wasted. Bernie Sanders spoke before a large crowd in South Carolina = Progressive agenda will benefit African Americans and other minorities. Another young black woman, Jayde Barton, a recent college graduate, praised Sanders’s proposals 5 for free tuition at public universities and reduced interest rates on student loans. + Three black women waited in line to hear Sanders. = “I’ve heard Bernie Sanders on TV and he says the right things.” on affordable health care, education, equal pay and racial justice. “The momentum from coast to coast has been extraordinary…those kinds of crowds, that type of enthusiam is what we’re seeing all over America and what we’re seeing here today in Greenville …This is a campaign on the move and it’s a campaign that going to win.” — Sanders and the crowd roared its agreement. This entry was posted in BERNIE SANDERS BROADENS HIS APPEAL IN OF ALL PLACES SOUTH CAROLINA and tagged BERNIE SANDERS BROADENS HIS APPEAL IN OF ALL PLACES SOUTH CAROLINA. Bookmark the permalink. I am a life long conservative who LOVES Bernie Sanders. Why? Because I have a severely disabled daughter. She needs medical cannabis. Bernie isn’t against medical cannabis. I can’t find a job. I’m broke. I need education. I can’t afford an education. I”m tired of the rich getting richer. I’m done with the Republican party. Pro life? That was why I was conservative. No more. What difference does it make to be pro life if Republicans are against helping the life once it’s out of the womb? Republicans cut the budget of all the programs for disabled and vets! Hillary Clinton is nothing but scandal. Scandal. Scandal. I’m so tired of this woman. She’s nothing but trouble. We need focus. Clarity. Bernie Sanders is without scandal. He’s a clean cut nice man who cares about people. When a reporter nearly fainted near him, Bernie rushed to her side. He is a GENUINE PERSON. Clinton is cold and phony. She can’t be trusted. 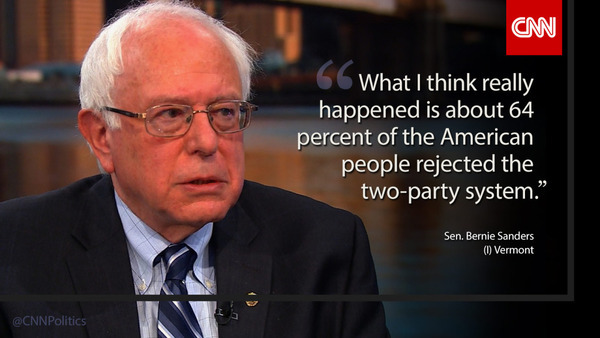 BERNIE SANDERS FOR PRESIDENT. Get out there South Carolina and VOTE. Bernie Sanders will fix this system and bring justice to the American People. Thanks for this Hector! Very well done!